Modern Game are mocked by both enthusiast’s and general public all the time. Comments such as “I think you should call the RSPCA, because that bird is seriously under-fed”, or one of my favorites I have heard, “The Modern Game is basically just a Sparrow on stilts”. But little do these people know how magnificent and full of history these birds are. Colours: Are the same that OEG came in. Namely Black-red, Brown-red, Blue-red, Pile, Birchen, Duckwing, Crele, Wheaton, Black, White, Lemon-Blue, Dunn, Ginger, etc. Price: Birds can range in price from $50 to $200, depending on quality, age, bloodline, and sometimes color can make a difference. Appearance: The Modern Game is a bird unlike any other. It has longer, more out of proportion legs than most others, and a long neck to match. This breed has a very lean and refined appearance. The Modern Game originated in Britain in the later part of the 19th century. 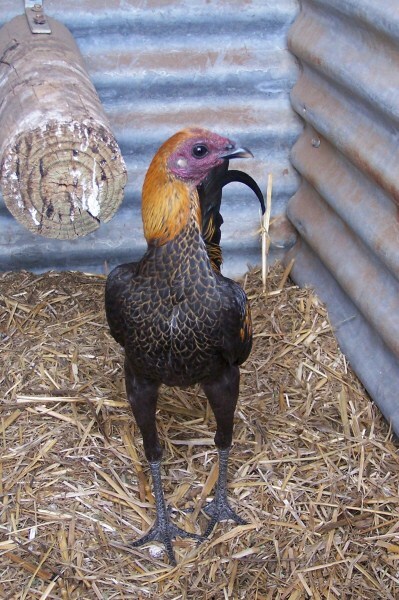 The Modern Game was bred purely as an exhibition bird, to increase the appealing features of a game bird. 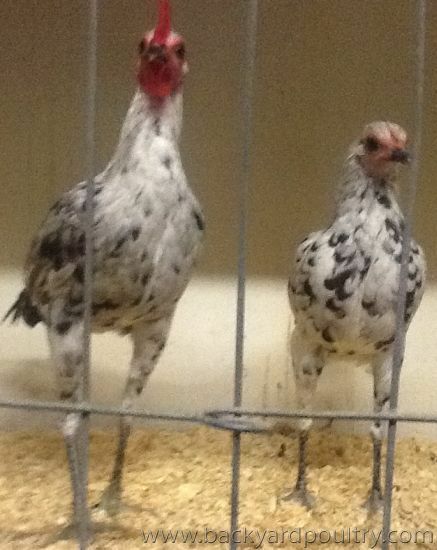 Upon the outlawing of cockfighting, many of these enthusiasts turned to breeding and exhibiting in shows, to remain in some kind of poultry hobby. This is when the Modern Game was developed, bred by crossing Old English Game and Malay Game, and then breeding the offspring. 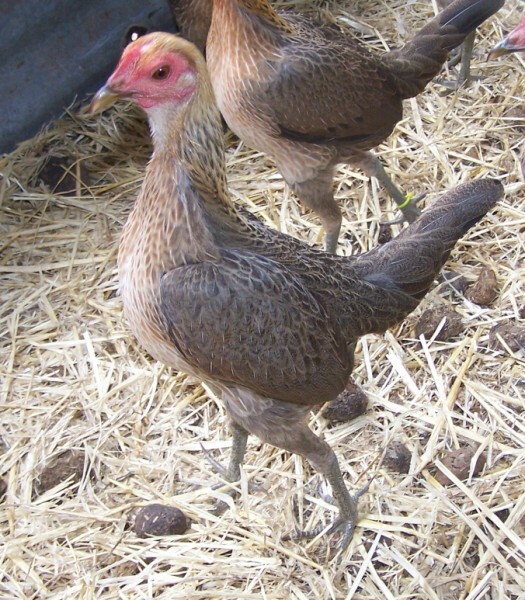 Although placed in the Gamefowl section (which usually means “deriving from cockfighting”), this breed was not bred for fighting. Through the transition towards what we now know today as Modern Game, the birds had to undertake a radical change in able to reach such standards. They started of smaller and musclier, and then slowly grew in height, until reaching the height which is seen today. The birds today have a body which some refer to as a “flat iron”, a fine tail, generally short back, upright carriage, and firm, fitted feathers. 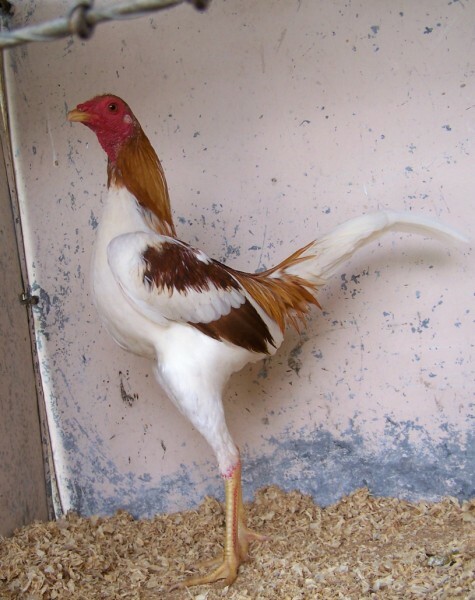 colors are separated into two groups, light leg and dark leg. Light leg being the yellows and creams, and dark being the darker leg colors, such as the greens and blacks. As well as having a variety of leg colors, the Modern Game has variations in face color, beak color, and eye color. The face can be red, mulberry, or jet black, while the eyes can be brown, orange, red, or black. The beak color is more limited usually either being yellow, cream, brown or black. Each body color has its own combination of leg, face, beak, and eye color. Eg. Pile, has yellow legs (being a light legged bird), a red face, red eyes and a yellow beak. 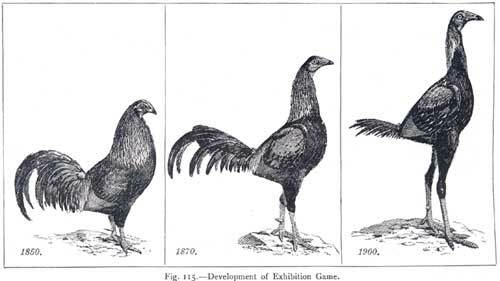 The Modern Game is the perfect exhibition fowl. It has an eye catching appearance, with its almost direct vertical carriage, and its almost flawless coloring, it is hard to walk straight past a bird as extraordinary as this. Carriage- Upstanding, active and alert. 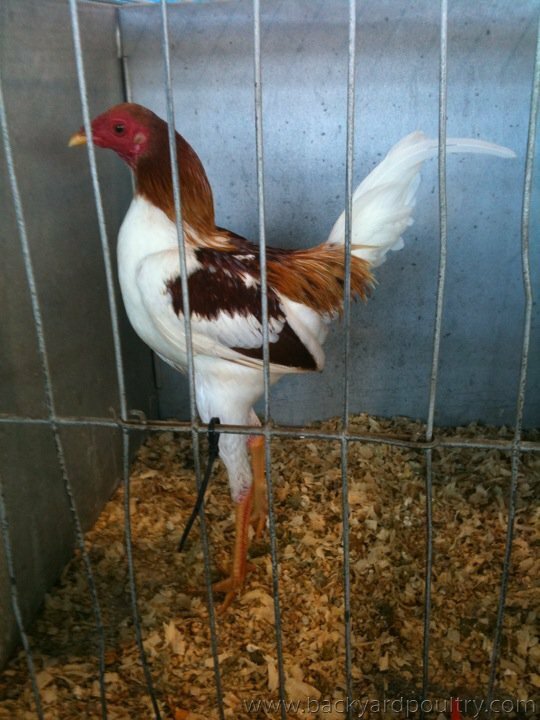 When approached in the show pen, the bird should stand with pride, and pose with posture. The back should be sloping slightly downwards towards the tail, showing plenty of lift as thought reaching upwards to the fullest height with eyes directly above the feet when posing. Type- Body short, back flat, front wide and tapering to the tail, shaped like a flat-iron. Breast well developed, evenly curved, broad and full. Belly small and tight. Shoulders prominent and carried well up. Wings short and strong, carried well up. Tail short, fine, closely whipped together, carried slightly above the level of the body, the sickles narrow, well pointed and only slightly curved. Head- Long, snaky and narrow between the eyes. Beak long, gracefully curved and strong at the base. Eyes well rounded, prominent, bold, bright and clear. Comb single, small, upright, of fine texture, evenly serrated. Face smooth. Ear-lobes and Wattles fine and small to match the comb. It is customary to dub Modern Game males, leaving the head and lower jaw smooth and free from ridges. 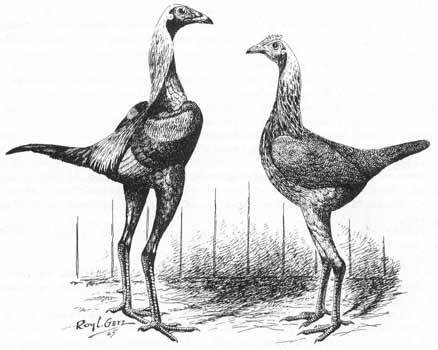 Neck- Long, lean and slightly arched, fitted with short, narrow feathers, but thin at junction with the body. Plumage- Short, hard and glossy with a minimum of fluff. Legs and feet- Legs long and well rounded. Thighs long, fine and muscular. Shanks long, straight, well rounded and free of feathers. 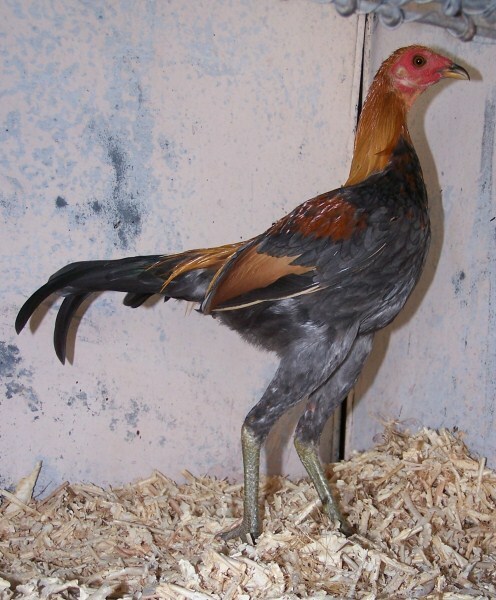 Spurs fine, set low and firmly attached in adult males. Toes four, long, fine and straight, the fourth (or hind) toe straight out and flat on the ground, not downwards against the ball of the foot (or “duck-footed”) which is a disqualification. 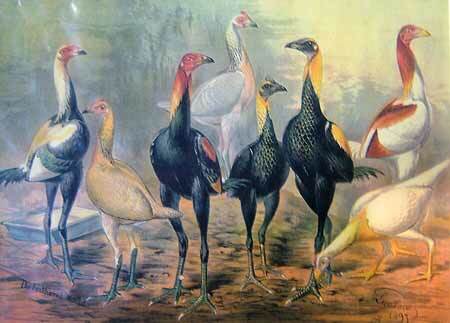 Modern Game are a slow growing bird, unlike other game birds such as Malay or Australian Game. The best thing you can do, is to feed them whole meal substances such as wheat, and of course regular access to greens. A lot of people feed their young Moderns on turkey grower. This increases the speed of growth, but it also makes them bigger framed and takes the elegance away from these birds. For show birds, a mash of bread, full-cream powdered milk, warm water, and tinned cat food will work a treat. The birds love the taste, in winter it keeps them full of protein and gives them that extra edge to survive the winter, and the oils in the cat food will bring out the shine in the feathers. 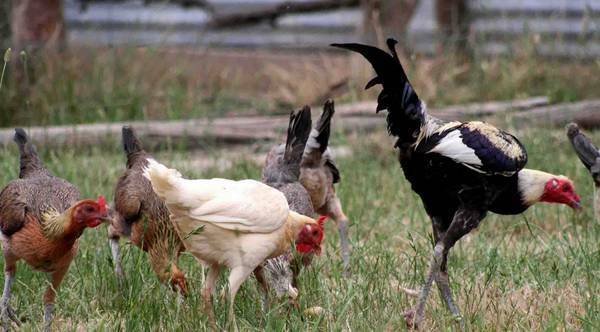 A better known mix which is made ideally for breeding birds is a mix of pollard, meat meal, and lucerne charf. This gives the females a large amount of protein, so this will usually increase egg production. But the best thing for the birds, which is usually the case for every other breed of poultry, is to give them access to greens were the can free range, excercise, and enjoy a relatively natural moment. Modern Game have a diverse range of uses. 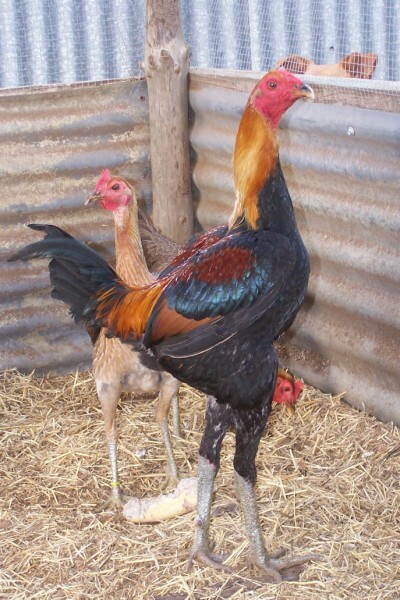 They are mainly an exhibition bird, but it is not uncommon to find bantams in a backyard as pets, and some even use the large fowl as a meat bird. 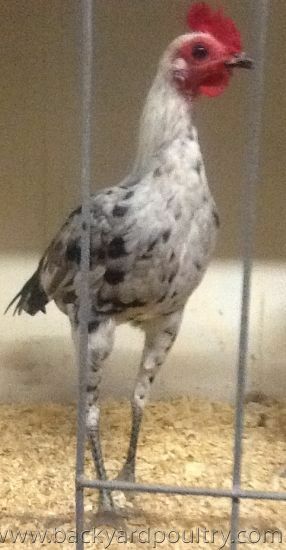 But by far this breed is mostly used for exhibition. The Modern Game bantam is a rather fragile bird. 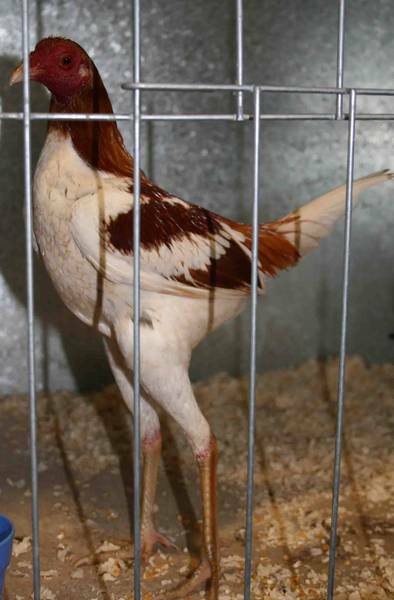 The lack of meat on this breed leaves the birds susceptible to feeling the cold more than other breeds, and it is very noticeable on a cold show day, with the bird standing with its neck sunk in and having an overall sickly appearance. But most bloodlines of large can handle the cold chill of winter. The best thing to do to keep them warm through winter is to have wind protective shelter, a dry place to roost, and to keep them up with their usual diet, plus some extras to put some fat on them like minced meat, or a pollard mix. A site worth checking out is the Modern Game Club UK. They have a great color table. Last edited by mattv on Sun Feb 01, 2009 12:49 pm, edited 3 times in total. Good work Matt, LOVE the photo of the large Mods free-ranging! thanks nick and muscovy jase. iv had it ready to go in my computer in a word document and just havnt gotten the time to actually put it on. funny thing about the photo of the birds free ranging is the photo was so big i had to crop it right down and make it smaller. it just squeezed under the limit. I love how they look and i found this really informative. A while ao i was looking to buy some large moderns but couldnt find anyone who would sell them to me. 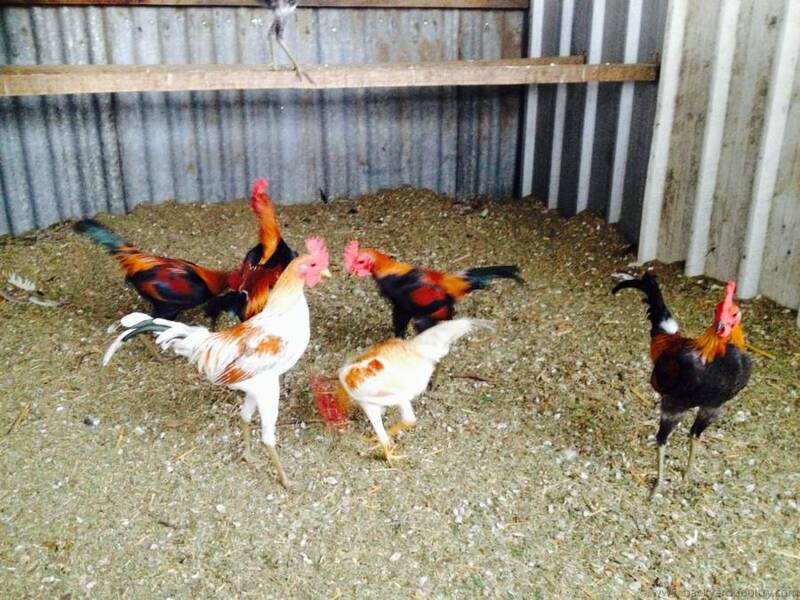 breeder of standard and bantam langshans, Bantam Rhode island reds and modern game bantams in pile and black red partridge. 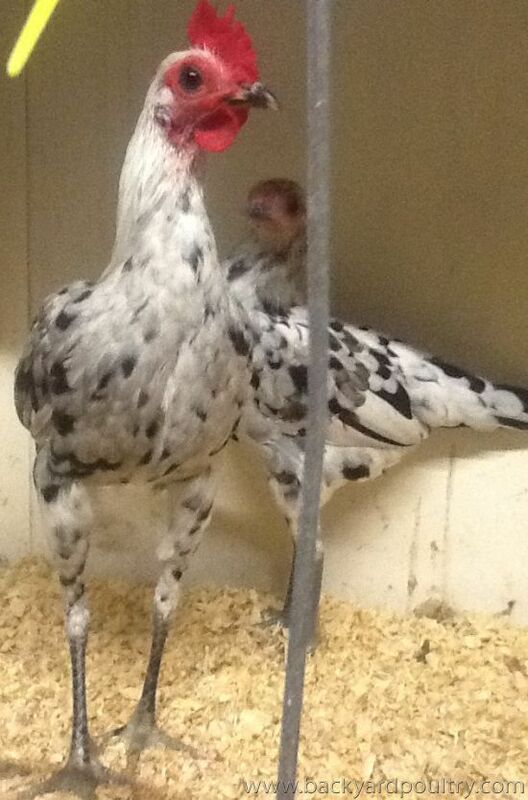 secretary for Goulburn poultry fanciers society. Well done mattv, you have done a great job there. This breed I like alot. thankyou for the profile matty. i disagree with one thing though. i saw these little birds living outside in scotland and it amazed me how tough they must be. it was freezing the day we saw these birds and it started snowing about an hour after we left. This active thread has some lovely photos of Modern Game chicks: Fingers crossed and good luck. 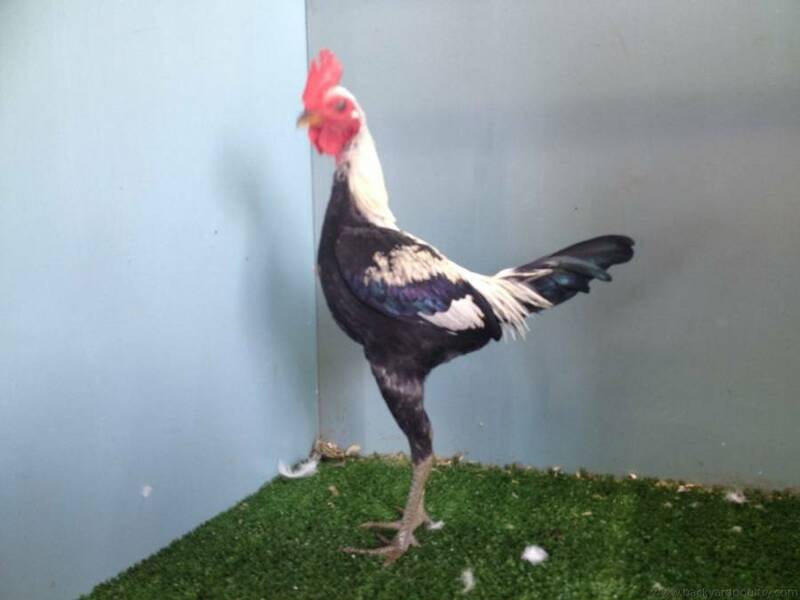 Splash bantam modern game on sale at Gatton Auction 2013. These were popular and sold for $175. I'm not sure. Might have been Clive Claus. They attracted a fair bit of attention. A selection of images from the BYP Gallery. Click on image to find owner details.